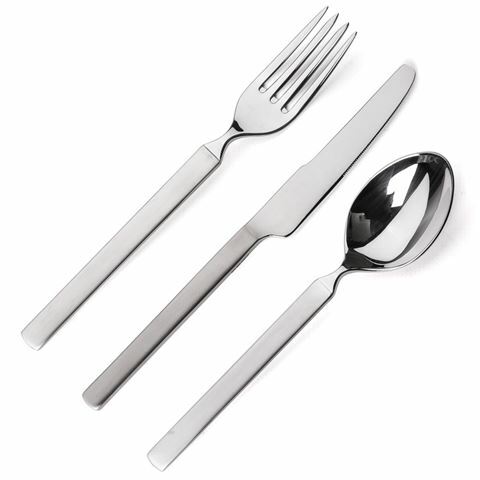 Alessi’s 24 piece Dry Cutlery is everything you want in a a set of utensils, modern, distinctively shaped, unprecedented yet very practical. Crafted from durable 18/8 stainless steel, this stylish set boasts handles with a brushed, satin finish,while the heads of each piece have a shiny, polished finished - the perfect complement to any modern kitchen. The handle of each server has a brushed, satin finish, and the heads of each piece have a shiny, polished finish. Presented as a 24 piece set in a Alessi Dry gift box. 6 x Knives - 22.5cm (l). 6 x Forks - 19cm (l). 6 x Tablespoons - 19cm (l). 6 x Teaspoons - 17cm (l).